Double, double, toil and lead? Film Review: "Death of a Ghost Hunter"
Spirit Store Locator Up and Running! If Ron Chaney's new film effort is enough to get horror film fans excited, the upcoming release of "Dracula The Un-Dead," the first official literary sequel to Bram Stoker's literary masterpiece, should do even more for fans of the literary persuasion. Written by a great-grand nephew of Bram's , Dacre Stoker, and Ian Holt, the novel will be released on October 13, 2009. Sadly true, the literary market today is overcrowded with vampire novels-- not all of them quality. However, "Dracula The Un-Dead" has much more going for it than just the Stoker family name; we have a fictionalized character of Bram himself involved with the descendants and proteges of his characters we all know and love. "Dracula The Un-Dead is a bone-chilling sequel based on Bram Stoker's own handwritten notes for characters and plot threads excised from the original edition. 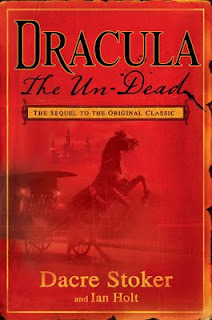 Written with the blessing and cooperation of Stoker family members, Dracula The Un-Dead begins in 1912, twenty-five years after Dracula "crumbled into dust." Van Helsing's protégé, Dr. Jack Seward, is now a disgraced morphine addict obsessed with stamping out evil across Europe. Meanwhile, an unknowing Quincey Harker, the grown son of Jonathan and Mina, leaves law school for the London stage, only to stumble upon the troubled production of "Dracula," directed and produced by Bram Stoker himself."